Next in our series of interesting applications for an in-chamber vacuum sealer -- did you know that you can use it to accelerate the pickling process for fruits and vegetables? With a vacuum sealer, the flavor profile that used to take one to three weeks to develop can be recreated in as little as two days. Simply follow the familiar steps of the pickling process: build a brine and add it to your produce -- pickles, onion, watermelon, etc. 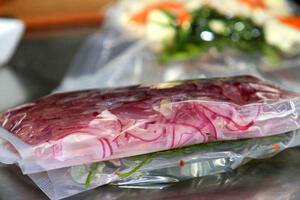 Then, instead of using jars to hold the produce while it pickles, seal it in a vacuum sealer bag. The nature of vacuum sealing means that the brine will be drawn into the produce more quickly, shortening the pickling time. If you're interested in finding out more about this and other surprising culinary techniques for vacuum chamber sealers, download our new eBook, More Flavor, More Life: 28 Inspired Applications for a Vacuum Chamber Sealer. In addition to pickling, you'll find out some other creative ways to use this versatile piece of kitchen equipment that you may not have thought of.